Guake indicator is a compact and convenient Ubuntu Appindicator that lets you send commands and customized tasks to Guake/Guake3 terminal. Guake is a free, open source, top-down terminal written in Python by Max Ulidtko,Pierre-Yves Chibon, Aleksandar Krsteski, Lincoln de Sousa, Gabriel Falcão. Nowdays Gaetan Semet is the project leader, in 2018 he wrote Guake3, a complete GTK3 version of the old Guake. 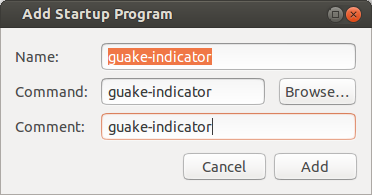 Although Guake indicator was meant for Ubuntu it should work on any Debian based Operating System using The Gnome Desktop Environment. This page refers to guake-indicator version 1.0 and later, if you want to read the old documentation about previous releases click here. Running Guake indicator is very easy, just invoke "guake-indicator" from a shell, of course the binary must be in path. Each time guake-indicator starts it must decide if to point his dbus messages to Guake or Guake3, from version 1.3.2 the default terminal is Guake3 but it 's still possible to force Guake 0.X version passing -guake0 as first argument. In older versions it's possible to force Guake3 terminal rather than Guake 0.x passing -guake3 as first argument. Guake indicator sticks to your "Ubuntu Indicator Area" and displays your customized command retrieved from ~/.guake.indicator/guake-indicator.xml. If this file doesn't exist, Guake Indicator will create a small default one that you can use as a base to build your own configuration file depending on your needs. Is it possible to force a specific xml file providing his full path as an argument, for example: guake-indicator ~/Dropbox/guake-indicator-jsons/conf.xml In this case file conf.xml is used rather than the default one, of course you can combine the custom configuration file with -guake0 and -guake3 switches, in this case the configuration file must be the last argument. lfcr : if set to yes a LF (Line Feed) + CR (Carriage return) is sent to Guake after each line. Otherwise, only a line feed (ascii code 10) is sent. The above xml field are all optional (except menu_name) and must be stored within a XML Host parent field which in turn is enclosed within a HostGroup field. For more information about how the configuration file must be created you can download the XSD Schema validation file. If Guake is not started, Guake indicator, when invoked, will launch it automatically.